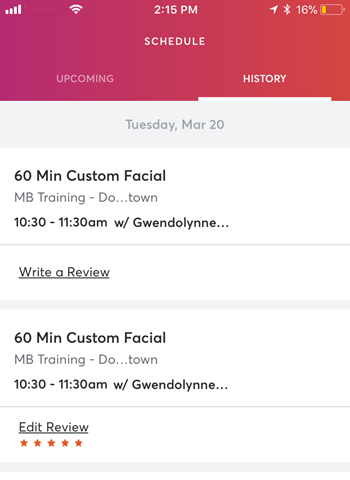 You can view your past visits by tapping History in your Schedule screen. Go to the web booker and click Log In at the top right to log in to your account. After logging in, click your name at the top right of the screen and select Schedule. You should see tabs for both your upcoming and completed classes. You can also search any business you've visited from here to login directly for that location and view your entire visit history with the business.